Amy Freeland of Copper Diem is hosting a blog hop today to benefit Ears To You, a very special jewelry donation program for women undergoing chemotherapy. Ruth Crane founded Ears To You after undergoing chemotherapy herself, and finding that she felt more attractive, more "normal" when she was able to accessorize. “I started Ears To You to help other women deal with hair loss and provide a way for them to feel good about themselves at a time when life can seem uncertain and scary.” Thanks to Amy for pointing me to this thoughtful organization - I am so happy to be included in this effort to send a bit of support and encouragement to these women during a challenging time. How lovely, I'm sure the recipients will love their gifts. Beautiful earrings made with love. Love all the different styles and colors. They will appeal to many women. Lovely and such a nice variety. Love the colors and textures on all of them. Yay, you! What a great cause! Your earrings are gorgeous and I know they will be appreciated by the women who wear them. What a great idea and what lovely designs! I know the women who receive your earrings will be absolutely thrilled! My mom went through chemo four years ago, and I know how important it was for her to be able to feel like she looked 'normal'. We made all sorts of fun hats for her and she bought several wigs, so she could be a blonde one day, a brunette the next and a redhead the third. That made it kind of fun. But we didn't think of earrings. First- absolutely love your designs! Second - the way you presented them with the address in the center - genius! Great to see so many sending out the love today. 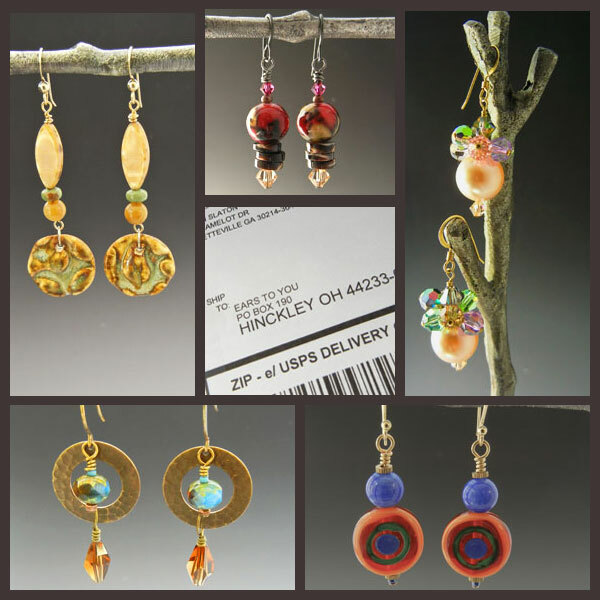 I love how each pair of earrings is different - and yet each is just as beautiful! Any woman would love to be the recipient of these earrings! Beatufiul job! Your earrings are just fabulous! These will all be so enjoyed by someone out there. These are awesome, gorgeous designs and gorgeous colours! Wow, those all turned out so pretty! Thanks so much for participating in the hop! Beautiful - great colors and textures!